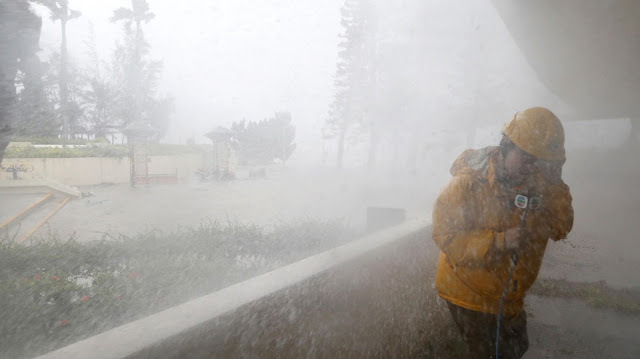 Hong Kong's weather observatory issued its highest storm warning alert - a signal T10 - and the normally bustling city was all but shut down as transport was suspended and torrential rain flooded roads and buildings. Winds of 173 kilometres per hour (107 miles per hour) and gusts of up to 223 kph (138 mph) were reported, stronger than Hurricane Florence that hit North Carolina over the weekend. There were no reported deaths in Hong Kong, a city well prepared for tropical cyclones. Airports in Shenzhen, a technology hub across the border from Hong Kong, and on the resort island of Hainan also cancelled all flights, according to Chinese state media. Mangkhut is now expected to move inland to western Guangdong. While the storm has weakened, a T8 warning was still in place into Sunday evening - meaning that winds with speeds of about 63 kph were expected. Mangkhut is expected to be one for Hong Kong's record books. It's only the 15th time in the last 60 years that a storm has been classified as T10; the last was for Super Typhoon Hato last year. Hong Kong's famed Victoria Harbor was also hit with a storm surge of more than 3.9 meters (12.8 feet) above chart datum on Sunday. More than 550 flights at airports in Hong Kong, Shenzhen and Guangzhou were also cancelled, according to Flightaware.com. Hong Kong authorities had been warning residents to prepare for the storm for days, and on Saturday, grocery stores were packed with people stocking up on goods. Buildings across the city were either boarded up or had their windows taped in order to mitigate the damage of broken glass. Other cities around the Pearl River Delta - which includes Hong Kong, Guangzhou, Shenzhen, Zhuhai and Macau - were also on high alert.